Sylvie Quinn, 8, of Sudbury, biked at Lawrence Academy. Matt Quinn of Sudbury looked forward to teaching his younger daughter, Sylvie, to ride a bike. From the age of 5 or 6, Sylvie had expressed eagerness to learn, and Quinn had enjoyed going through the process with his elder daughter, Amelia, a few years earlier. But when the two set out for Sylvie’s first lesson, it didn’t go well. As a child with autism and hypotonia, or low muscle tone, Sylvie had trouble mastering the necessary motor skills. Her inability to balance caused her anxiety and frustration, and Quinn didn’t know how to help when the usual parental technique of giving one good push and watching the bike wobble away didn’t work. So when Sylvie’s mother, Jana, saw 8-year-old Sylvie ride a bike for the first time last month, she cried with joy. Not only that; she had to watch the whole scene several times on video that evening to assure herself it really had happened. Because what Matt Quinn didn’t have the necessary training to do, the staff and volunteers with ICan Bike did. ICan Bike is a nonprofit program whose mission is to help people of all ages with physical and developmental disabilities learn to ride a bicycle. 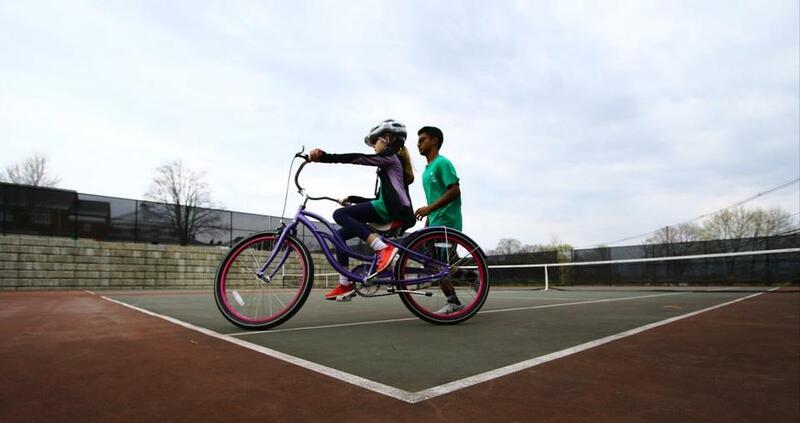 This April, they made their second yearly trip to Groton, where Lawrence Academy donated the use of its hockey rink for five days of biking instruction. By the end of it, nearly 40 children, teens, and young adults had mastered a new skill. But it’s not just about biking, as Mary Evans, senior physical therapist at Emerson Hospital’s Center for Rehabilitative and Sports Therapies, explained. ICan Bike brings along a crew of expert bike techs to help with the equipment, but the motivation and encouragement come from a team of locally recruited volunteers, including Ty Anandaraj, a 15-year-old from Westford who returned to help for the second year. 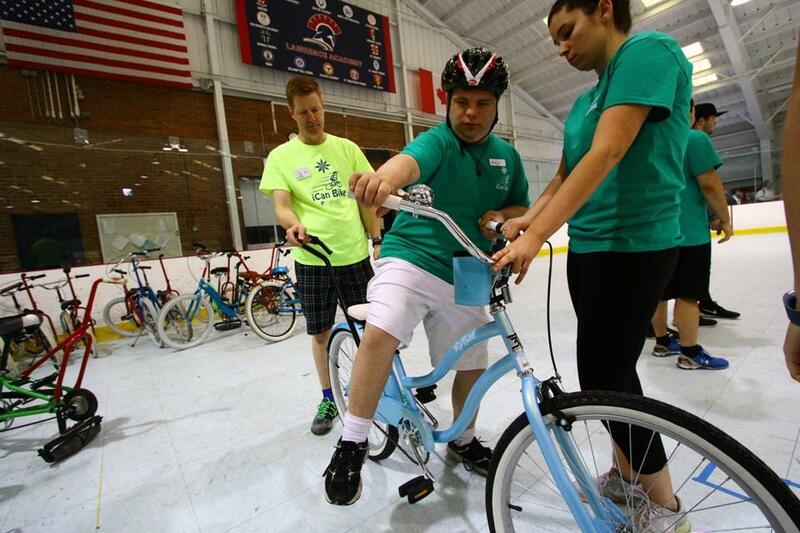 Sandy Day of Chelmsford saw her 21-year-old son, Alex Fee, who has Down syndrome, learn to ride a bike this year. Like most of the other campers, he rode with a staff member on a tandem bike before he set out on his own. By the end of the week, like many of the young people who enroll in the five-day program, Alex could ride on his own. Evans, the physical therapist from Emerson Hospital, has seen kids do more than just ride bikes. But the benefits of the bike camp extend beyond fun and fitness, Evans said. Alex Chatfield, director of Concord’s Minuteman ARC Early Intervention, has witnessed the benefits of the ICan Bike program for children with a variety of developmental disabilities — and for their families. “For many parents of children with disabilities, access to recreational activities and to recreational pursuits in the community can be a big barrier,” Chatfield said. Jana Quinn is one parent who believes she will take home some lessons from bike camp. “As the parent of a kid with special needs, you get into the habit of not letting yourself reach for the sky. You don’t want to be disappointed,” she said. Ashley Michals, a UMass Lowell student, helped Alex Fee, 21, of Chelmsford onto his bike.